Picking up where we left off yesterday. Charles & Brian were up at 5am to get the car cleaned one more time before driving it to Forsyth Park for the Porsche Concours d’Elegance. Veronica & I took a cab over (about 5 hours later) driven by none other than Emmit Smith! Unfortunately not the 'real' Emmit. There were an insane amount of Porsche's. Just how many? I have no idea. We walked around and took in the sights. There was a lunch provided, the concours where there was judging of the cars, then a corral where other Porsche owners just parked their cars for the masses to admire. Charles' car took home first place for his division! Of course he said it also took in last place, since it was the only car in the division, but hey, he won right? Congratulations, Charlie! There was also a raffle for a restored 1973 911T Coupe that apparently had been found in California and then shipped to Germany for restoration. You can read more about it here. The unveiling was held at the concours festivities, and they will announce the winner at the Victory Banquet on Saturday night... we're keeping our fingers crossed for Charles! Once things were winding down, Brian got curious about all the German Porsche peeps looking at his dad's car. They were filming and all! We stuck around the park until around 3pm then headed back to the hotel for a dip in the pool before dinner. 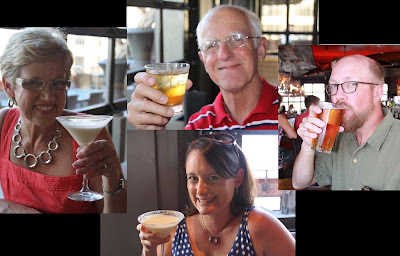 We walked to The Bohemian Hotel to get a drink at the rooftop bar before catching a taxi ride over to 17hundred90 for dinner. The bar served up a delicious Creamsicle martini as seen in the photos of me & Veronica below. The guys stuck with boring scotch and beer. We slurped all of those down before Brian finished one beer! Here are some shots of the scenery. Mmm... little did we know that it was Restaurant Week in Savannah, so we ordered from the prix fixe menu. I had escargot in a mushroom sauce over a puff pastry, hanger steak with mushroom risotto & asparagus with carrots, and the most delicious bread pudding I've EVER eaten. Sorry there are no photos of this meal. I was so hungry after all those martinis that I jumped right in! Back at the hotel, in the elevator up to our rooms, a guy said, "man, you could be famous..." (since Brian looked like the photo of the statue in the elevator). To see the entire photo album from Day 2 of our trip, click on the photo below! looks like fun--and a new dress?? Target! Funny that you noticed! are you sure that's not abe lincoln? haha! Brian wasn't happy that I posted that pic, he didn't see the resemblance. ;) Could be Abe. Not sure!